Hand made doll from St. Thomas, Virgin Islands. She is wearing a bright colored dress and matching head scarf. Her dress has a white lace collar. Her cotton pantaloons also have lace trim, and her shoes made from lace. Her head is made from a large mango seed, and her arms and legs are wire. Her torso is stuffed material. She has black fiber hair and a hand painted face. 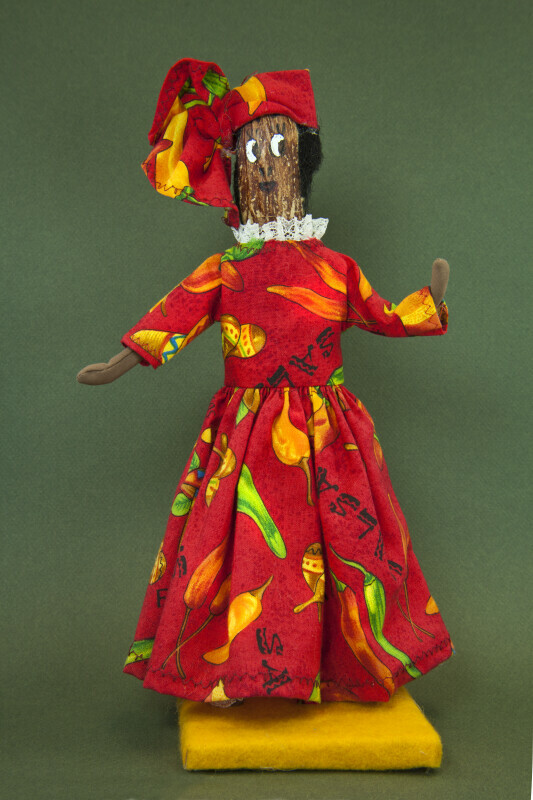 Tag: "Hand Made by Gwendolyn R. Harley.” Gwendolyn is well known for preserving the culture of the Virgin Islands through her hand-sewn, softly sculptured historic dolls. The figure stands 12 inches (30 cm) tall.